The Val d’Anniviers is a true hikers’ paradise with over 490 km of marked paths. Unspoilt nature, authentic villages like Grimentz, Zinal, St-Luc and Vercorin and unique panoramas stretching across the Alps including the Matterhorn, Weisshorn, Zinalrothorn, the Dent Blanche and even as far as the Mont Blanc. Some of the mighty 3000-meter peaks are easily accessible from St-Luc : the Bella Tola and the Touno. The Val d’Anniviers is at the heart of the Mountaineers’ Route linking Chamonix and Zermatt, between the Val d’Hérens and the Val de Turtmann. Original huts like Tracuit and Moiry are accessible with plunging views onto the glacier bearing the same name. St-Luc - Chandolin - St-Luc via Ch. Prosper 3h 30 min. St-Luc - H.Weisshorn - Prilett 4h. St-Luc - cascades - Touno 4h. 15min. St-Luc - cascades - Meidpass 4h. St-Luc - Forcletta - Gruben 6h 40 min. Tignousa - Le Touno 3h. 15 min. Tignousa – the lakes - Tignousa 4h. Tignousa - Bella Tola 2h. 50 min. Tignousa - Chiesso - St-Luc 1h. 50 min. Tignousa - Meidpass - Gruben 4h. 20 min. Tignousa - Forcletta 3h. 20 min. Tignousa - Zinal 4h. 20 min. Chandolin - Pramarin-Tsapé 1h. 45 min. Moiry - ch.2500 - hut-Moiry 4h. 50 min. Moiry - l.Autanes-col Torrent 2h 45 min. Moiry - Sorebois-Zinal 4h 20min. Moiry lake-hut 2h 45 min. Sorebois - Pet.Mountet - Zinal 4h. 15 min. Zinal - hut.Pet.Mountet 2h. 30 min. Zinal - Roc.vache-Zinal 4h. 50 min. Zinal - hut Tracuit 5 h.
Zinal - hut Arpitettaz 4 h.
St-Luc-Hôtel Weisshorn 2 h. 15 min. Tignousa-lac Bella Tola 1h 10 min. Grimentz-Basset de Lona 3h 15 min. Zinal-cabane Petit Mountet 1h. 30 min. 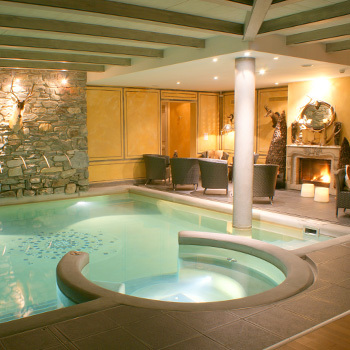 Our Grand Chalet Favre guests enjoy preferential prices at the Gd Hôtel Bella Tola’s spa and pool located just a 5-minute walk away.